Are you looking for voluntary experience to increase your skills and employability? Do you feel passionate about speaking up against injustice and tackling poverty? We are looking for students around the country to lead transformative campaigns on your campuses. Apply now to join Oxfam and mobilise others in demanding an end to inequality and corporate tax dodging, and speaking up for workers rights and refugee families forced to flee their homes. We know when people come together and take action, people power works! So if you feel angry about social injustice, have a passion for tackling poverty and have an interest in standing up and speaking out to push people in power to make positive social change happen, we want to hear from you! As a campaigner with Oxfam, you will bring together other students to develop and deliver campaign activities and events at university and inspire and encourage others to take action to tackle poverty. You will receive training in campaigning skills, receive one to one support, receive regular communications and receive a pack of resources. You will be invited to participate in Oxfam's events and campaigns at a national level. We will help you to build the skills, experience and confidence needed to help you develop personally and for your career. You will gain a host of transferable skills which lots of employers are looking for! This opportunity requires a level of commitment and we ask that you dedicate two hours per week for an academic year to help us make change happen. Oxfam is a global movement of people who won't live with poverty. Would you like to join us? Please note: All applicants must reside in the UK. What skills and experience will you gain? Represent and uphold Oxfam's values at University. Recruit students who want to campaign. Engage students in campaigning, providing inspiration and motivation to join in. Lead students to develop and deliver a plan of action and activity for each term. Create a safe, open and inclusive participatory environment for people to come together and share their thoughts and ideas. Keep others engaged, share information about the campaign and any other forms of inspiration. We will endeavour to reply to all applications within two weeks of submission. 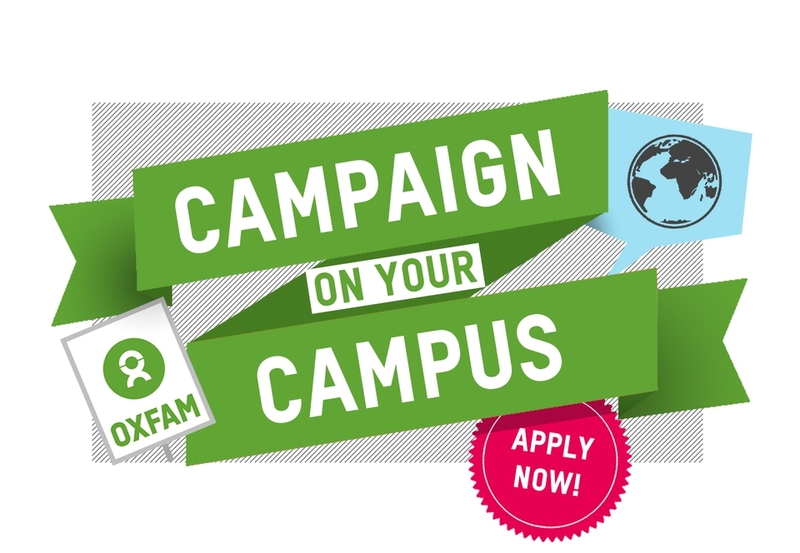 Please enter your details and tell us why you want to campaign with Oxfam on your campus. Once you're signed up, we'll contact you by email and phone to explain what's next and to help you with your volunteering role. We would also like to contact you from time to time to keep you informed of Oxfam's projects, fundraising activities and appeals. We will not share your data and you can unsubscribe at any time. We may contact you for up to two years from the day you give consent. You can change your preferences at any time.